San Francisco-based hospitality outfit Kimpton Hotels & Restaurants’ global expansion continues apace with the recent opening of Toronto’s Kimpton Saint George Hotel – the brand’s third address outside the United States. Located between the Annex neighbourhood’s bohemian charm and Yorkville’s affluent sophistication, the 14-storey, 188-room hotel was designed by local company Mason Studio, who created a sense of place with an artsy, lived-in look brightened by craftsmanship and pieces by top Canadian talent. 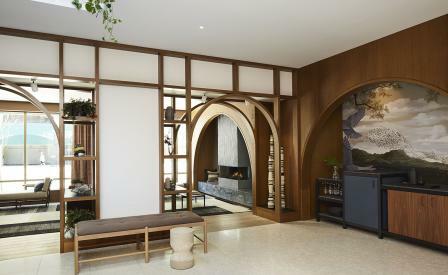 As such, the reception features millwork arches, a fireplace tiled with ceramic inlay, and quirky decorative objects – some found in nearby vintage shops while others were designed by Mason Studio in partnership with local artisans. The guestrooms meanwhile pay homage to the Annex’s heritage houses. Some of them date back to the 18th century and typically feature a contrast of textures thanks to generations of owners who add character to their homes through furnishings and accessories collected over a lifetime. At Kimpton Saint George, this mix-and-match aesthetic shows up in the custom carpet with a diamond herringbone pattern, the freestanding armoire in natural oak, comfy chairs in yellow velvet, and brass-legged marble side tables.